Texas Comptroller Glenn Hegar told lawmakers Monday they need to set aside $211 million in the next biennium to cover a projected shortfall in the state’s original prepaid tuition plan, the first time the financially ailing program is expected to see its assets drop below zero. The money will be paid out of the state’s general revenue fund. The plan, called the Texas Tomorrow Fund, allowed parents to prepay for their children's college educations, locking in then-current rates for tuition and fees. The program was fully guaranteed by the state, and 158,442 contracts were sold between 1996 and 2003, when the plan was closed and tuition, which had been set by legislators, began to be set by the colleges themselves. Since then, the cost to attend a public college has doubled, outstripping the earnings made by the fund’s investments. At the end of Aug. 2017, the plan's estimated unfunded liability topped $613 million and it was projected to be short on cash as early as 2020. Because the program is guaranteed by the state, general revenue funds are used to plug its deficits. 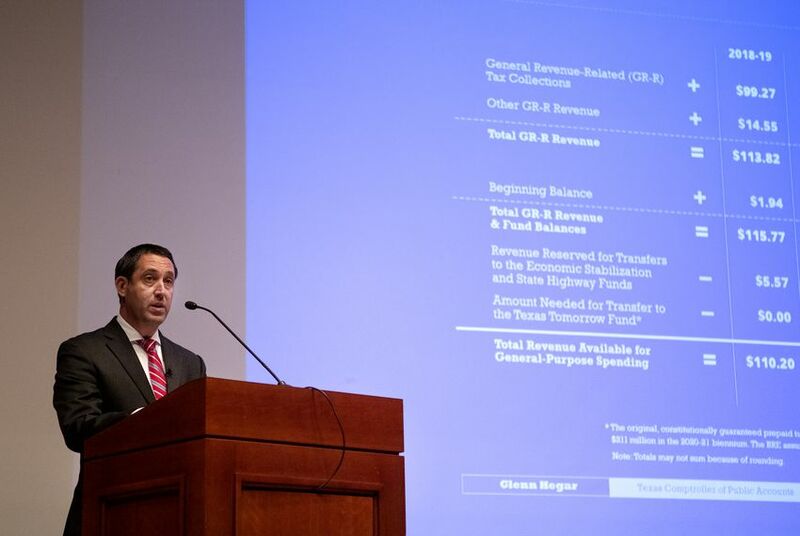 Hegar announced the $211 million shortfall while unveiling a biennial revenue estimate that detailed how much money lawmakers have available to write the 2020-21 state budget. In an earlier fiscal report, Hegar seemed to encourage lawmakers to front-load the costs of the tuition program’s liability, saying an immediate investment could save up to $49 million down the line. The contracts made through the program, now called the Texas Guaranteed Tuition Plan, won't be fulfilled until near 2040. "In all due respect, the numbers that we're talking about in the overall budget picture aren't that substantial — certainly our pension problems outweigh the Tomorrow Fund," he said. “But I think it does point out that the state has a number of long-term issues we're going to have to deal with. We might not be able to solve them all this session but if we can at least make a substantial down payment, it's a wise use of our resources." “If everybody who still has a contract” — there are some 53,000 — "goes to the cheapest possible university, then that's less cost to the state,” she said. The comptroller's office will release a report later this month estimating the program's shortfalls over the next few budgets, said Kevin Lyons, a spokesperson for the agency. Explaining the program's deficit, Lyons said: "Several actuarial assumptions used in setting prices for the plan did not pan out. Tuition rose more than expected, while the fund’s investments returned less than expected." The state began a new prepaid tuition plan in 2008, called the Texas Tuition Promise Fund, but it is not guaranteed by the state. Disclosure: The Texas Comptroller of Accounts, the Center for Public Policy Priorities, the University of Texas at Austin, the University of Texas at San Antonio, Texas Tech University and the Texas Taxpayers and Researchers Association have been financial supporters of The Texas Tribune, a nonprofit, nonpartisan news organization that is funded in part by donations from members, foundations and corporate sponsors. Financial supporters play no role in the Tribune's journalism. Find a complete list of them here.